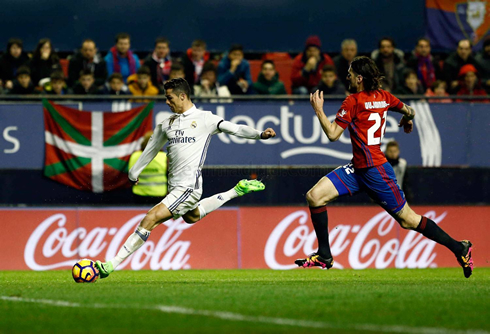 There were no surprises in Pamplona, as Real Madrid visited Osasuna and beat the locals 3-1. Ronaldo, Isco and Lucas Vázquez scored for the Merengues, who are now 1 point ahead of Barcelona in the standings, with still 2 games in hand. 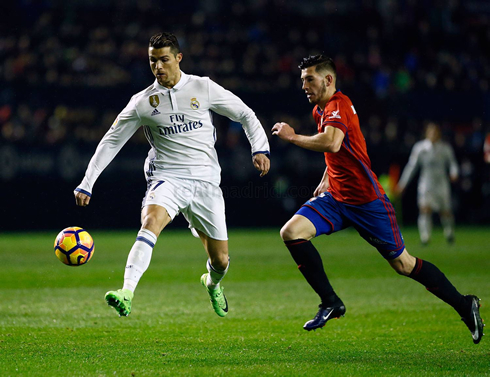 A 3-1 win from Real Madrid over Osasuna assured the 3 points would be brought to the Spanish capital this Saturday night in Pamplona. 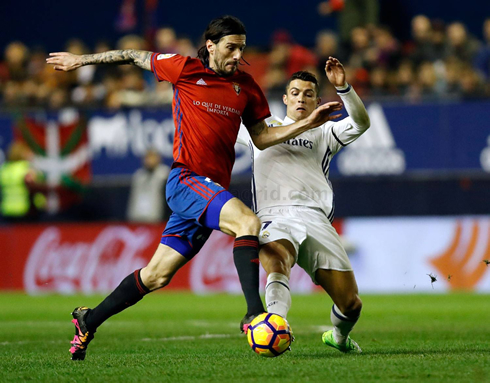 The Merengues needed a victory in order to keep on the top of La Liga standings, since Barcelona had already won their match earlier in the day and at this point, still have played 2 league fixtures more than Madrid. Tonight, the opponents only started bleeding after a Cristiano Ronaldo goal in the first half, but reacted shortly after and got the equaliser still before the break. In the second half, Isco restored the lead to the European champions and Lucas Vázquez confirmed the win deep inside added time. Next is Napoli on Wednesday, for the Champions League last-16 round. On paper, it should have been easy. First place Real Madrid against 20th placed Osasuna, the only team in Europe's top 5 leagues without a home win to their credit. And while it may not have been pretty, but it was crucial as Madrid were able to maintain their lead at the summit of La Liga with a 3-1 victory in Pamplona. If there is one solid takeaway from this game, it's the idea that Zidane should probably stop it altogether with the 3-5-2 formation. 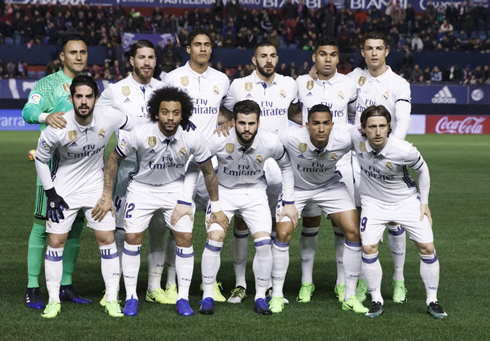 It's the formation that famously lost Madrid their match against Sevilla and today, Madrid looked far better after the formation was abandoned. Unfortunately, it was changed due to what looked like a serious injury to Danilo. Regardless, Madrid looked far better in the second half with Isco, in particular, putting in a great shift and getting a goal to boot. 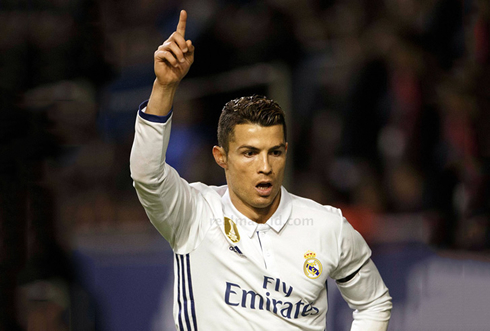 Ronaldo opened the scoring for Madrid with his 14th league goal of the season. Peeling away from the defense after receiving a nice pass, Ronaldo's shot had too much on it for on-loan goalkeeper Salvatore Sirigu, who did get a hand to hit. But Madrid would relent the lead befoe the end of the half, as Sergio Leon found himself free and chipped Navas with ease. However, Madrid were far more effective in the second half. Isco, who had a great game especially with his defensive tenacity in midfield, gave Madrid a 2-1 lead midway through the second, picking up the scraps after Benzema stumbled in the box. Later on, Lucas Vasquez would make it 3-1 when a great Ronaldo dummy left him free in the box. It's important to remember that prior to this match Madrid hadn't played for around 2 weeks, so it was expected they would be a bit sloppier than usual. But now, Los Merengues head into a dangerous match up with a sparkling Napoli side that is sure to give them trouble. All eyes will be on Zidane's lineup choices then. Cristiano Ronaldo next game is a Champions League fixture, on February 15 of 2017 against Napoli. You can watch Juventus live stream, Real Madrid vs Napoli, PSG vs Barcelona, Swansea City vs Leicester City, Bayern Munich vs Arsenal, and Benfica vs Borussia Dortmund, all matches provided from our live soccer game pages.